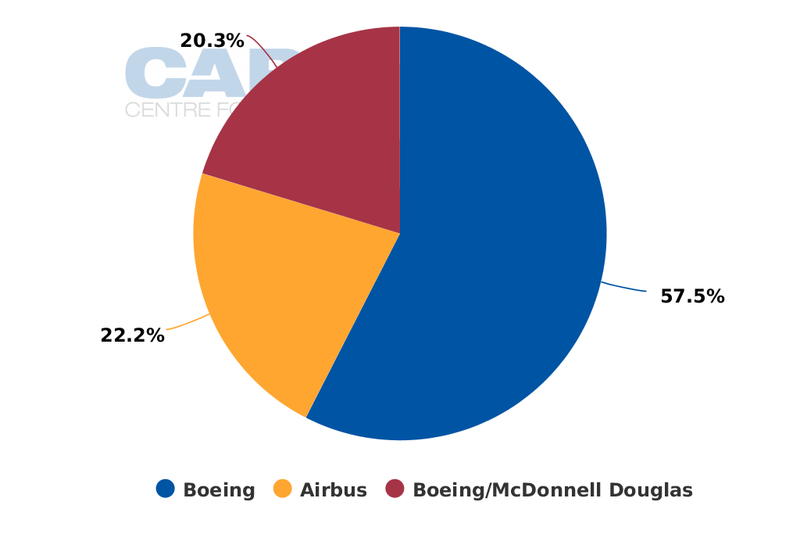 The Bombardier-Delta-Boeing triangle created by a recent tentative decision of the US government to place tariffs on 75 CSeries jets in Delta’s order book is the latest chapter in a years-long grudge match between Delta and Boeing - one that was spurred by Delta’s campaign to institute reforms of the ExIm Bank as part of the airline’s quest to quash what it deemed as unfair competitive advantages held by the three large Gulf airlines, Emirates, Etihad and Qatar. Now Boeing’s rival Airbus has joined the fray, pledging to take a stake in the CSeries programme, which would allow Bombardier to sidestep the potential tariffs imposed on the new generation widebody aircraft. The result of the deepened ties between Airbus and Bombardier is that Airbus now influences approximately 75% of Delta's order book. The Airbus twist puts the administration of US president Donald Trump in an interesting position. The airframer has pledged to add a new assembly line at its US manufacturing plant to build CSeries jets, which obviously creates US jobs and supports his “America First” agenda. Delta's and Boeing’s relationship became tense after the airline attempted to change policy at the ExIm Bank, claiming that the bank’s loan guarantees for foreign airlines could hurt US airlines by allowing non US airlines to charge lower fares on international routes to the US. Back in 2011, Delta unsuccessfully sued to block loan guarantees to Air India for 30 widebody jets. The loan guarantees also became tangled up in Delta’s broader campaign against Emirates, Etihad and Qatar, claiming that those airlines are illegally subsidised by their governments. Delta argued that airlines that are creditworthy and receive assistance from their respective governments should be ineligible for ExIm assistance. The 777 family represents 79% of Emirates’ 209 aircraft on order, according to CAPA’s fleet database. In late 2014 Delta placed an order for 50 Airbus widebody jets – 25 A350-900s and 25 A330-900neos. During 2015 the ExIm Bank was temporarily shuttered – the first time in its history. But later that year the bank’s charter was reinstated until 2019. Both Delta and Boeing spent millions to bolster their respective stake in the ExIm bank’s future, even as Delta at that time had a solid number of Boeing 737-900ERs on order. In Apr-2016 Delta placed an order for 75 Bombardier CSeries aircraft. It was a landmark development for Bombardier – securing an order for the CSeries from a major US airline after multiple programme delays and sluggish sales. One year later (after Donald Trump won the US presidential election) the US government began investigating claims by Boeing that Bombardier was selling aircraft in the US market below cost, and that the airframer was illegally subsidised by the Canadian government. In Sep-2017 the US Department of Commerce tentatively determined that the CSeries should be subject to import tariffs of up to 300%. The International Trade Commission is expected to render a final decision in the dispute during 2018. Airbus has stepped in to escalate the trade spat. It has reached a deal with Bombardier to take a 50% stake in the CSeries programme, with Bombardier holding 31% and the province of Quebec retaining 19%. The Airbus-Bombardier tie-up includes Airbus lending sales and supply chain support to the fledging CSeries programme, and the establishment of a dedicated assembly line for the CSeries jet at the Airbus US manufacturing site in the state of Alabama. It is a game changer for the CSeries, which has not booked any firm orders since striking the deal with Delta more than a year ago. The partnership allows Airbus to market a portfolio of products ranging from 100 to 150-seat CSeries jets to the super jumbo A380. Bombardier attaches itself to Airbus’ powerful sales organisation, which can tout Airbus’ established support network as part of any CSeries sales package. The agreement also obviously strengthens ties between Airbus and Delta. 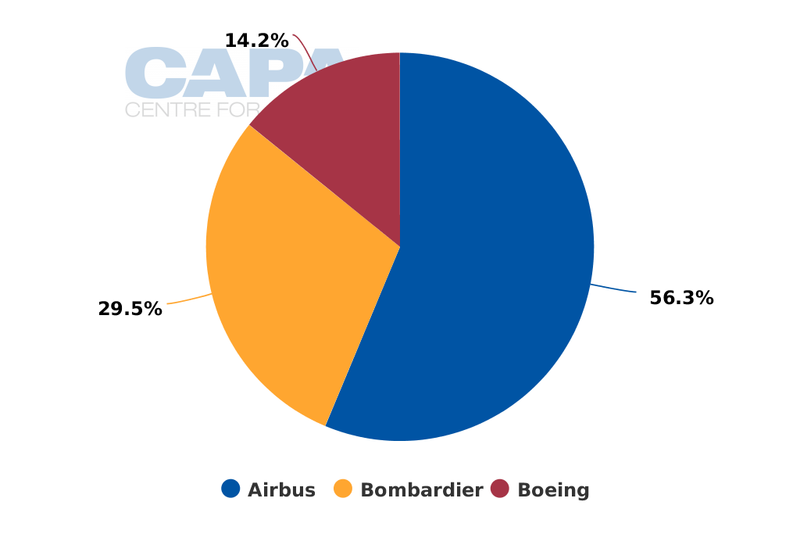 Data from CAPA’s fleet database show Airbus aircraft make up 56.3% of Delta’s aircraft on order, and Bombardier represents 29.5%. Combined, the airframers account for nearly 76% of Delta’s aircraft on order, which arguably gives Airbus some advantage in negotiating future orders with Delta. The airline is the third largest in the US based on system (domestic and international) ASKs. Prior to Airbus and Bombardier unveiling their new partnership, Delta exuded a certain level of confidence that it would not pay tariffs on its CSeries jets, while emphasising that it had no intention of not taking delivery of the aircraft. Delta CEO Ed Bastian deemed Boeing’s campaign against Bombardier as nonsensical, and expressed the view that it was difficult to determine how Boeing had endured any harm from Delta’s selection of the CSeries, given that Boeing had stopped producing its 100-seat Boeing 717 more than a decade ago. 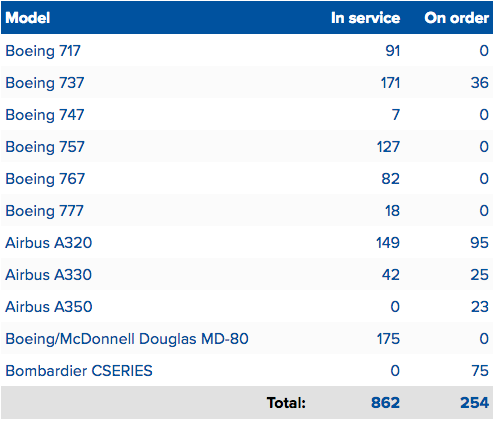 CAPA’s fleet database shows Delta is the largest operator of the 717, the type representing 59% of the operating fleet. Even as Airbus has a lock on Delta’s current order book, Boeing still represents 57.5% of the airline’s in-service fleet, which means the two companies maintain a strong relationship in spite of their opposing sides on major aircraft trade disputes during the last few years. The Boeing-Bombardier trade dispute has been thrust on the global stage, forcing the Trump Administration to adhere to its “America First” platform at the expense of straining relationships with key allies. Canada’s Prime Minister Justin Trudeau has warned that tariffs on the CSeries would prevent the Canadian government from purchasing 18 Super Hornet fighter jets from Boeing. After Airbus and Bombardier tabled their plans to collaborate on the CSeries, Mr Trudeau called Mr Trump to discuss the deal, including potential jobs for Americans in Alabama, according to the news outlet CBC News. Alabama is an important state for Mr Trump; he secured nearly 63% of the state’s vote in the Nov-2016 presidential election. Any move that appears to scupper potential jobs in the state would not look good for his administration. Airbus employs more than 500 individuals at its Mobile, Alabama, facility, and the establishment of a CSeries production line could potentially create hundreds of additional jobs. Wings for the CSeries are manufactured in Belfast, Ireland, and Bombardier employs towards 4,000 people in the region. The UK’s prime minister Theresa May has also warned that Boeing’s behaviour could jeopardise future Ministry of Defence contracts for the airframer’s aircraft, such as Apache helicopters; this is according to the news outlet The Telegraph. Ms May has also asked Mr Trump to intervene in the dispute. Trade disputes between aerospace companies have been occurring for decades. But this particular case, involving Boeing, Bombardier and now Airbus, has an added political dimension that perhaps has not been as prominent in past trade controversies. The political implications for the Trump Administration and the commercial effects on Boeing have the potential to be far reaching, and the outcome is not easy to predict.